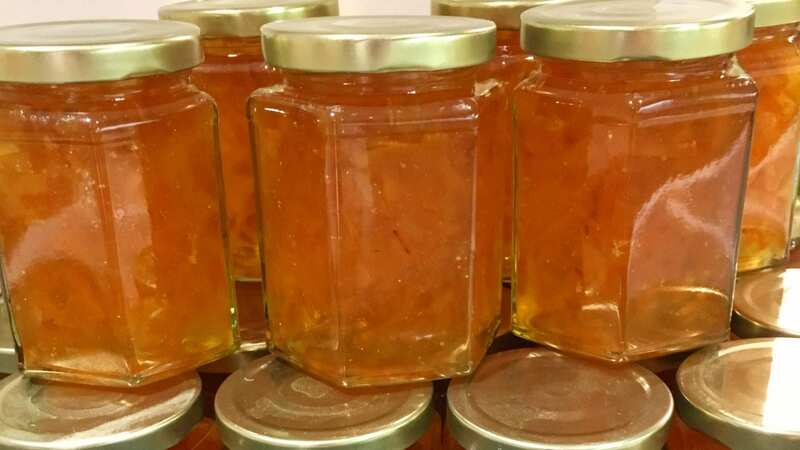 Would you like to try a little Marmalade instead? So much for quieter. In preparation for our annual Toast and Marmalade day, I visited our local greengrocer market stall, Collins of Chiswick, to ask about Seville Oranges and was told that I’d better buy them early to guarantee that I can get some before they sell out. So with a crate of 25kg, I decided to make a start on them one Saturday whilst the family were out at a football match. I made 50 jars that first day and another 66 jars on our course this week. Fortunately, Andy, unlike the King in the poem, thinks that it’s his favourite spread for bread and is delighted with the colour, set and flavour this year. A crisp clear day is perfect for pruning the apple trees, ensuring they are optimum shape for summer fruiting and chopping up the branches we’ve removed to dry out in the log store as firewood. A stroll around the garden making a list of jobs to do over the coming weeks and snipping at a few peach branches to avoid overcrowding is a gentle way to enjoy the winter sunshine and deserve a cosy fire when it gets dark. A good sweep up and quick weed in the kitchen garden reveals some broad beans that are already flowering and purple sprouting broccoli that’s nearly ready to harvest. Other harvests this time of year include a surprise crop of Jerusalem artichokes that jostled to the surface when I pulled away the old spent plants behind the bee hive. As a member of the sunflower family, the plants grow tall against a fence and have large flowers at the top, the edible tubers under the soil can be roasted, sauteed or mashed in with other root vegetables, I weighed my haul and logged it into our Harvestometer to discover that they were worth £4.50! Elsewhere, the garlic is coming along nicely and we’ve got cavolo nero and cabbages in the brassica bed and more eggs than we can eat coming from the hens. We’ve been very busy making sausages this month and, due to popular demand, we’ve had two courses which include making up to three varieties of sausage-meat each and then the options of making both traditional sausages in skins as well as a warm batch of freshly baked sausage rolls to take home. We are delighted to buy our free range pork from our local butchers, Hammonds of Kew Bridge.